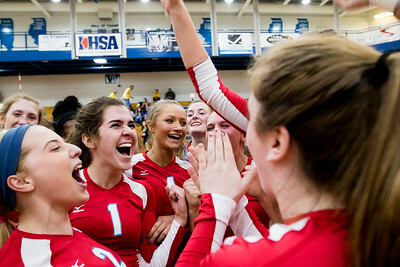 Sarah Nader- snader@shawmedia.com Marian Central celebrate after winning Thursday's Class 3A Woodstock Sectional volleyball final against Carmel Nov. 3, 2016. Marian Central won, 25-23, 25-19. 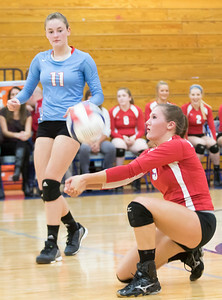 Sarah Nader- snader@shawmedia.com Marian Central's Brenna Koch returns the ball during Thursday's Class 3A Woodstock Sectional volleyball final against Carmel Nov. 3, 2016. 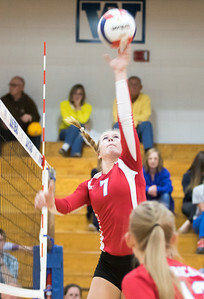 Marian Central won, 25-23, 25-19. 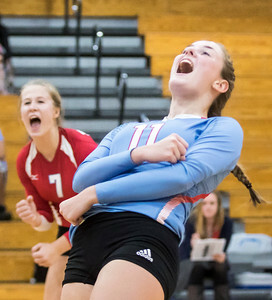 Sarah Nader- snader@shawmedia.com Marian Central's Meghan Schwallie celebrates a point during Thursday's Class 3A Woodstock Sectional volleyball final against Carmel Nov. 3, 2016. Marian Central won, 25-23, 25-19. Sarah Nader- snader@shawmedia.com Marian Central's McKayla Wuensch taps the ball over the net during Thursday's Class 3A Woodstock Sectional volleyball final against Carmel Nov. 3, 2016. Marian Central won, 25-23, 25-19. 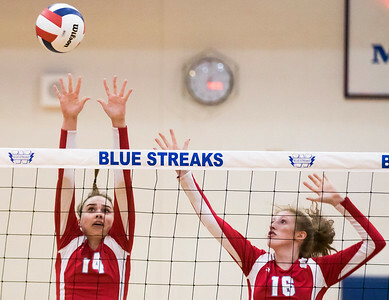 Sarah Nader- snader@shawmedia.com Marian Central's Lauren Hanlon (left) and Gabrielle Davis jumps to block a ball during Thursday's Class 3A Woodstock Sectional volleyball final against Carmel Nov. 3, 2016. Marian Central won, 25-23, 25-19. 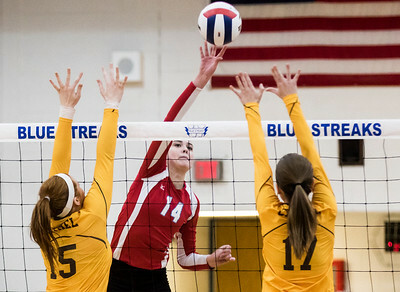 Sarah Nader- snader@shawmedia.com Marian Central's Lauren Hanlon (center) taps the ball over the net during Thursday's Class 3A Woodstock Sectional volleyball final against Carmel Nov. 3, 2016. Marian Central won, 25-23, 25-19. 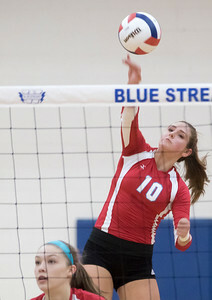 Sarah Nader- snader@shawmedia.com Marian Central's Sydney Nemtuda hits the ball over the net during Thursday's Class 3A Woodstock Sectional volleyball final against Carmel Nov. 3, 2016. Marian Central won, 25-23, 25-19. 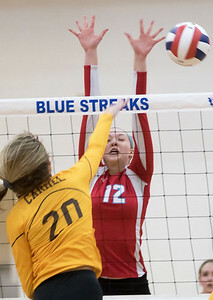 Sarah Nader- snader@shawmedia.com Marian Central's Rachel Noonan jumps to block a ball hit by Carmel's Lauren Nelson during Thursday's Class 3A Woodstock Sectional volleyball final against Carmel Nov. 3, 2016. Marian Central won, 25-23, 25-19. 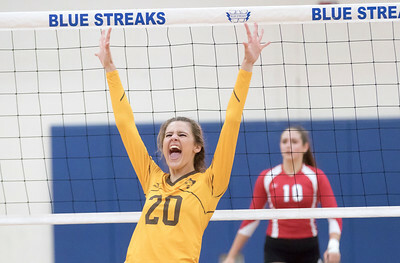 Sarah Nader- snader@shawmedia.com Carmel's Lauren Nelson celebrates a point during Thursday's Class 3A Woodstock Sectional volleyball final against Marian Central in Woodstock Nov. 3, 2016. Marian Central won, 25-23, 25-19. Sarah Nader- snader@shawmedia.com Carmel's Lauren Nelson jumps to block a ball during Thursday's Class 3A Woodstock Sectional volleyball final against Marian Central in Woodstock Nov. 3, 2016. Marian Central won, 25-23, 25-19. 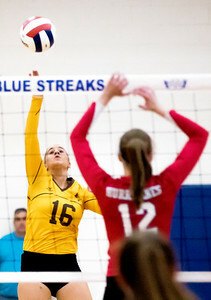 Sarah Nader- snader@shawmedia.com Carmel's Grace Butler hits the ball over during Thursday's Class 3A Woodstock Sectional volleyball final against Marian Central in Woodstock Nov. 3, 2016. Marian Central won, 25-23, 25-19. 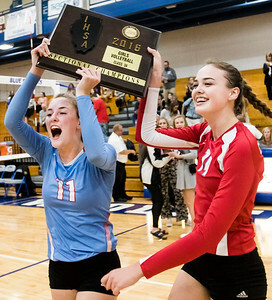 Sarah Nader- snader@shawmedia.com Marian Central's Meghan Schwallie (left) Lauren Hanlon celebrate after winning Thursday's Class 3A Woodstock Sectional volleyball final against Carmel Nov. 3, 2016. Marian Central won, 25-23, 25-19. 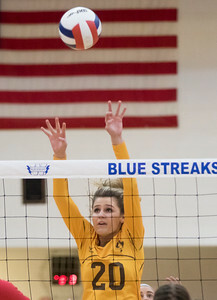 Carmel's Grace Butler hits the ball over during Thursday's Class 3A Woodstock Sectional volleyball final against Marian Central in Woodstock Nov. 3, 2016. Marian Central won, 25-23, 25-19.